In a light northerly wind and with the fog threatening to take hold of the Island in the afternoon there was precious little in the way of new arrivals today. 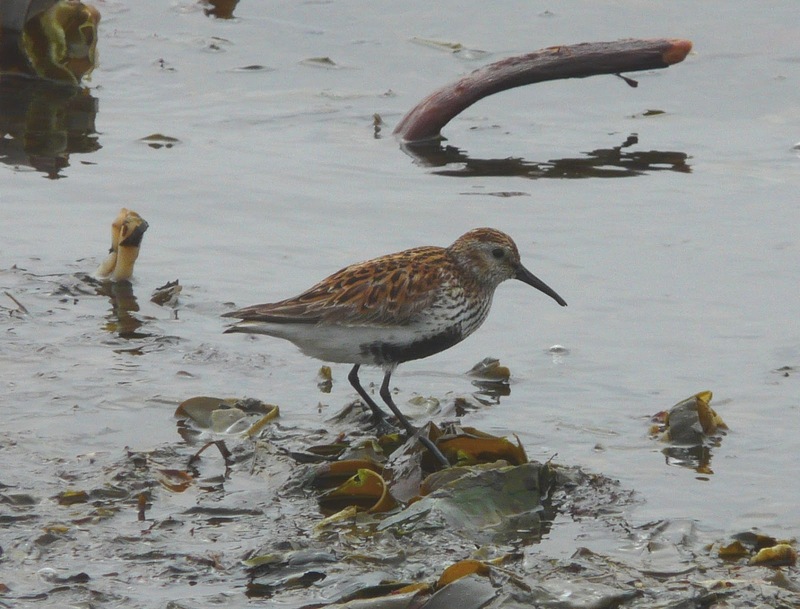 Just one of the Pectoral Sandpipers was still present on Ancum Loch and a Little Stint was with commoner species at Bridesness. 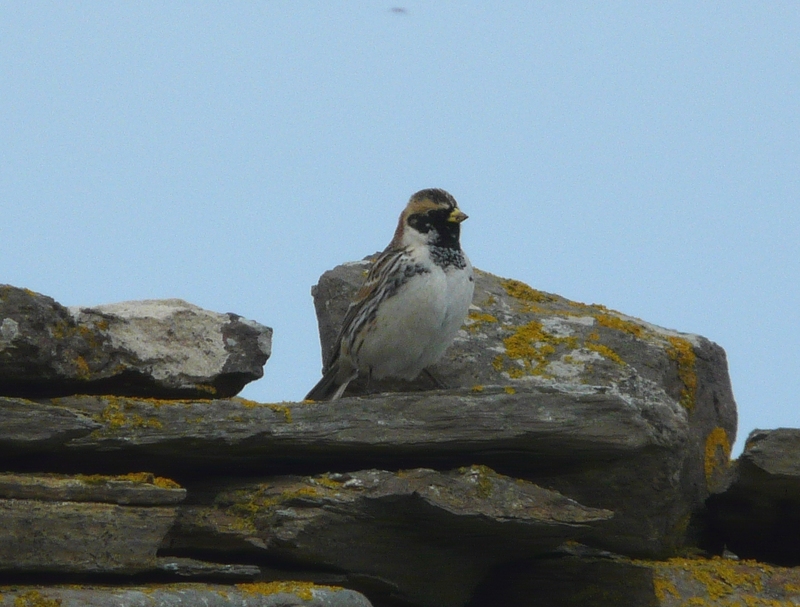 A Whinchat was near Gretchen, the Common Redpoll was at the Observatory, 13 Snow Buntings remain and there was the usual smattering of Warblers. 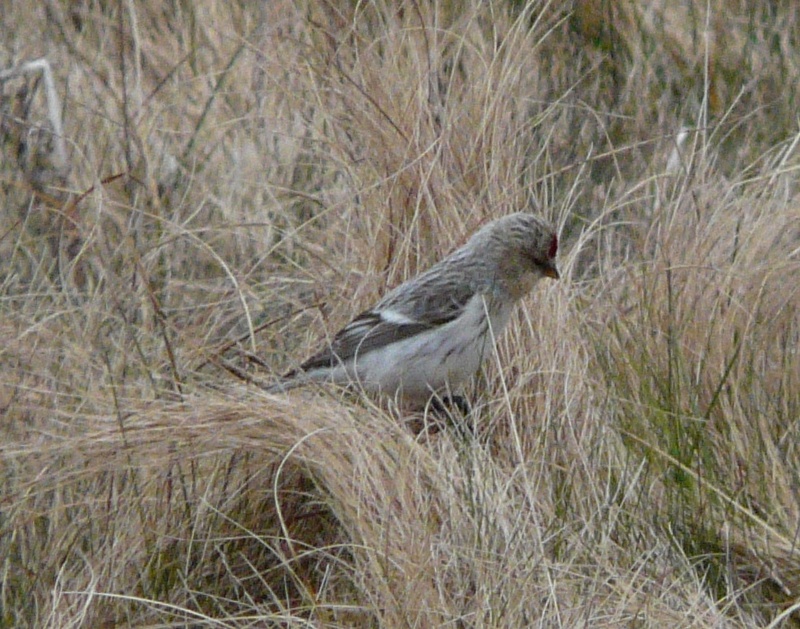 In a moderate north-westerly the mornings rounds were fairly quiet but at lunchtime a few birds started to arrive. Remarkably there were now 2 Pectoral Sandpipers present together on Ancum Loch in the afternoon-the first multiple occurrence for the Island in the spring! With news of rarities all over Shetland, an evening scramble turned up a male Bluethroat near Scotsha and another couple of Red-backed Shrikes were found, with new birds at Antabreck (male) and at Holland House (female) while the lingering female was still at Ancum. Other notable passerines recorded were a Sand Martin, 9 Sedge Warblers, 5 Garden Warblers, a Spotted Flycatcher, the 7 Tree Sparrows, a Common Redpoll and 14 Snow Buntings. A few Waders seemed to be on the move with 36 Bar-tailed Godwits the first for a while, and included 31 heading north, plus 9 Whimbrels and 16 Knot were seen. 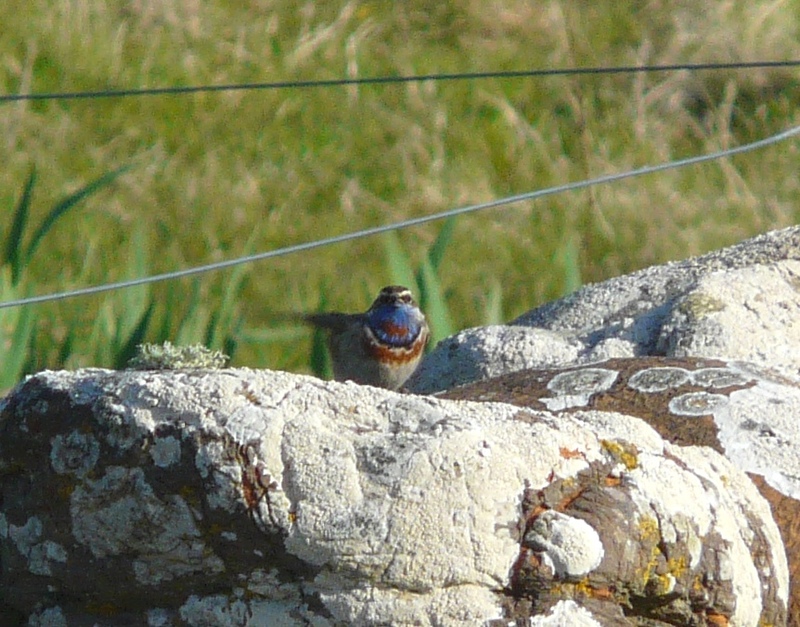 After just a single Bluethroat in the last 2 springs, its been a decent year so far with 4 recorded. Many must undoubtedly go undetected here though, with the Islands vast Iris beds largely unchecked each spring due to the breeding birds. This male showed for just a few minutes on the walls near Scotsha before disappearing into the aforementioned Irises at Hooking. In strong south-easterly winds little was seen in the morning, but in the afternoon a smart Pectoral Sandpiper was found feeding around the muddy fringes of Ancum Loch. 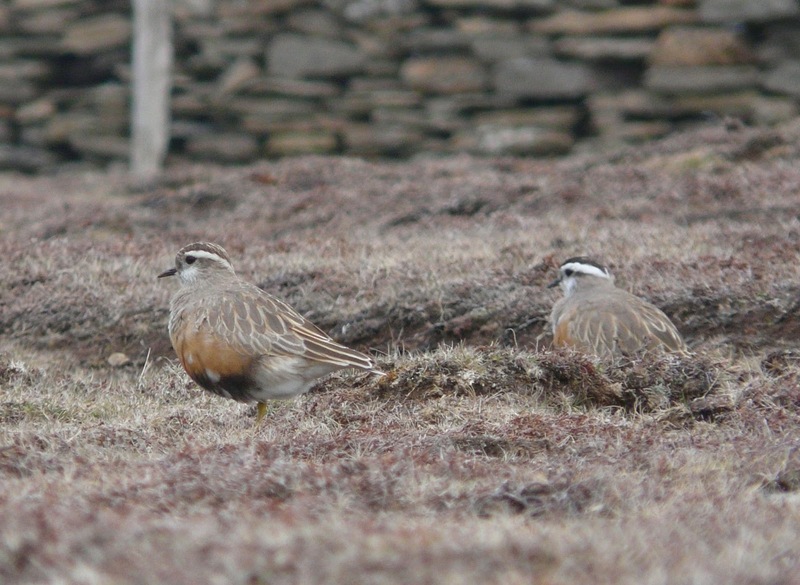 Like yesterday's Lark North Ronaldsay has amassed a total of nearly 40 'Pecs', mainly in autumn, with today's being just the seventh in spring. Passerine sightings were limited with 2 Blue-headed Wagtails on Ancum the highlight, while the long staying female Red-backed Shrike remains along with 25 Snow Buntings. Also seen were a Common Sandpiper, the first Merlin for a month and 2 Collared Doves. Another scorcher, with sunshine all day has left the Observatory supply of sun-cream running low! There were more new arrivals with some more expected than others and with the south-easterly wind due to pick up overnight, hopefully there will be more new in tomorrow? 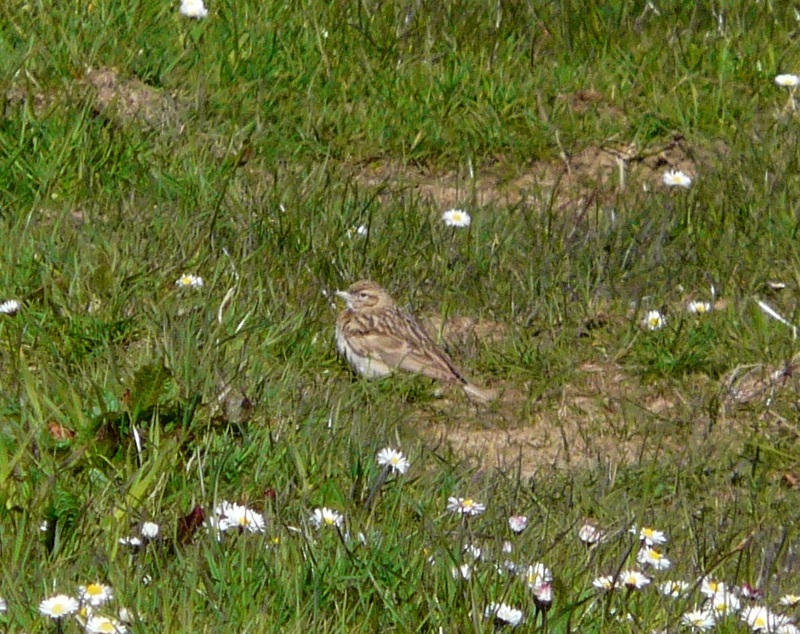 Stromness Point continues to be the hot-spot at the moment-there was no sign of the Tawny Pipit but a Short-toed Lark was found in its place mid-afternoon, in the fields between there and Greenwall. Less predictable newcomers, usually associated with early spring rather than late May included 2 more Whooper Swans, 4 Woodpigeons, a Song Thrush, 2 Redwings while at least 18 Snow Buntings remain. A handful of new Warblers were also noted with 9 Sedge Warblers, 5 Lesser Whitethroats and 7 Chiffchaffs logged, plus ones and twos of the other recently recorded species. At least 1 Red-backed Shrike is still with us (the long staying female at Ancum), 4 Common Scoters were off the Links and a Short-eared Owl was flushed from the area frequented by last weeks Paddyfield Warbler-which couldn't be found today so appears to have moved on. Nearly 40 Short-toed Larks have been recorded on North Ronaldsay, but today's was just the sixth in spring. Another day of glorious sunshine and no wind saw some more quality new arrivals, and has left us all a bit sun burnt! 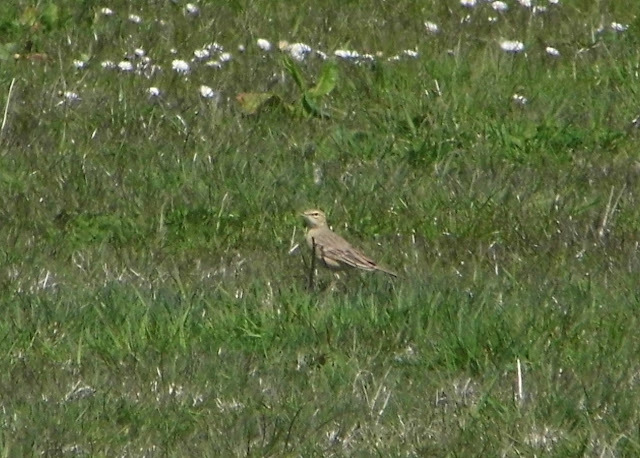 Topping the bill was a Tawny Pipit which showed well in the fields between Howar and Stromness Point in the morning. 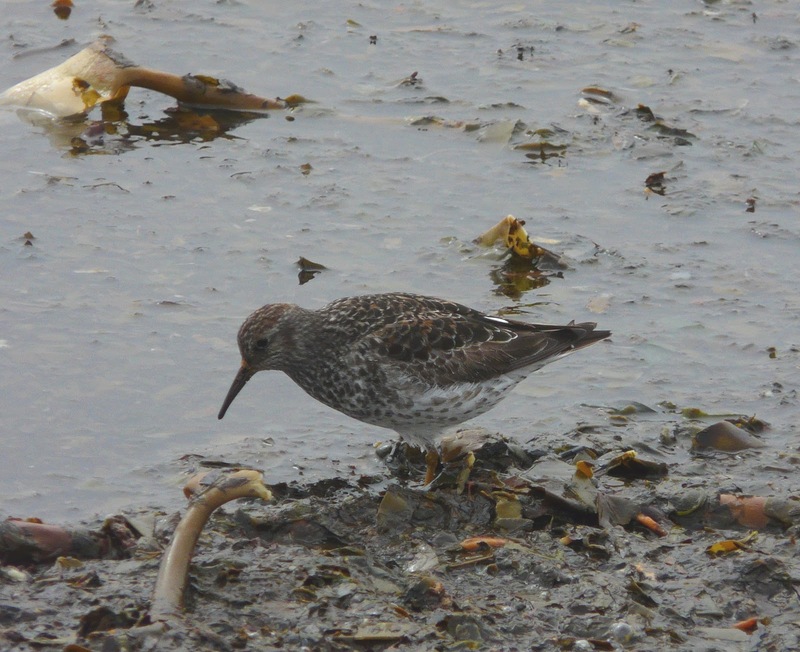 This is the third record for the Island and fifth for Orkney with all the North Ronaldsay birds having occurred in the last four years. 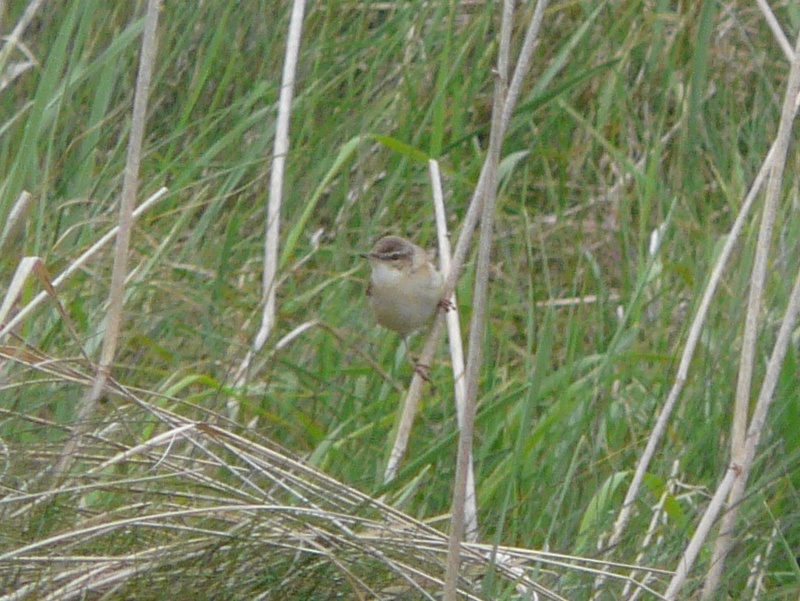 A female Bluethroat at Dennishill was also new and in a good spring for the species another 2 Red-backed Shrikes (both females) were present in the Bewan area, with the 2 lingering birds still at Ancum. The current strange, late spring influx of Snow Buntings continues with 42 present today, 3 Common Redpolls in the north included a smart pink male, the female Blue-headed Wagtail remains while 90 Wheatears included many Greenland race birds. Also of note today were 10 Barnacle Geese (first of year), a Hen Harrier, a Curlew Sandpiper which flew over Howar, 8 Black-tailed Godwits and 13 Lesser black-backed Gulls together in one field. A Common Tern was among 110 Arctic Terns and an hour long sea-watch from the hide saw 728 Puffins fly by. 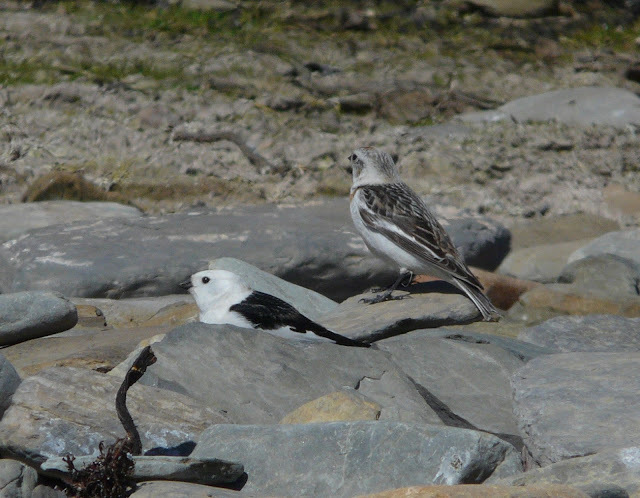 Its unusual to see so many Snow Buntings in May as they should have passed through some time ago. 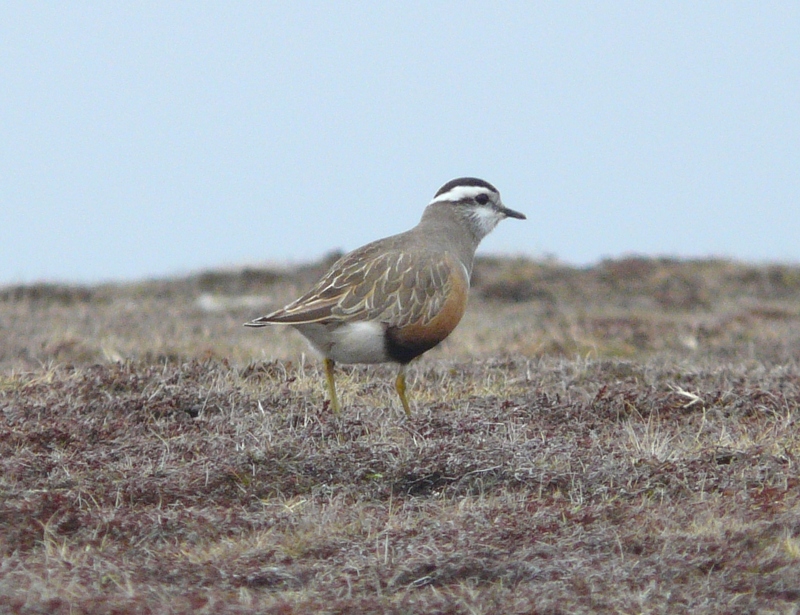 Plenty of today's 42 were males in stunning plumage just like the bird in the foreground. A completely different day to yesterday, with barely a breath of wind and plenty of late afternoon sunshine. After the sea-watching distractions of the last 24 hours the Paddyfield Warbler was found to still be frequenting the long grass at South Gravity. 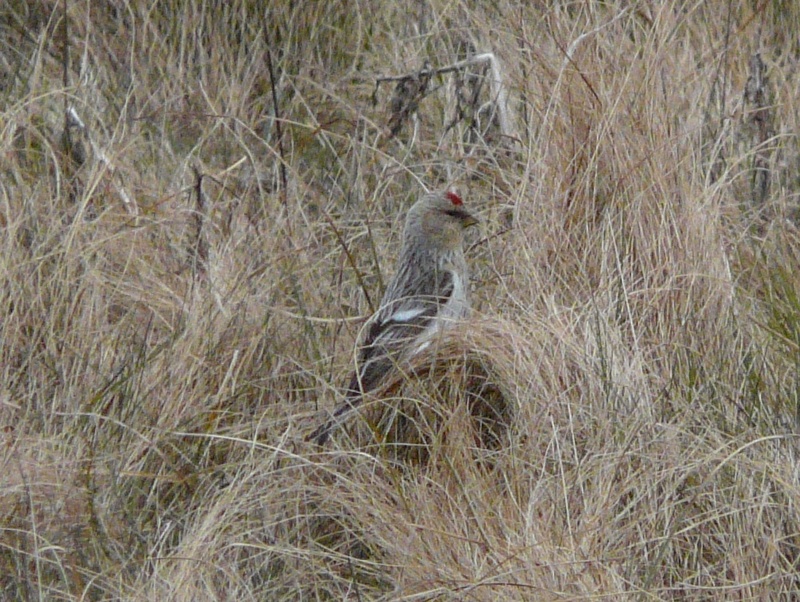 Once again it occasionally sang, but it can be very mobile and impossible to photograph! There were no sea-watches today, but another 2 Long-tailed Skuas floated north-west along the coast at Twingness mid-morning. There were a few new arrivals on land too, including a 'brown' Common Rosefinch at Holland House, a female 'flava' Wagtail, 13 Snow Buntings, a new male Sparrowhawk and Knot have increased to 20 birds. 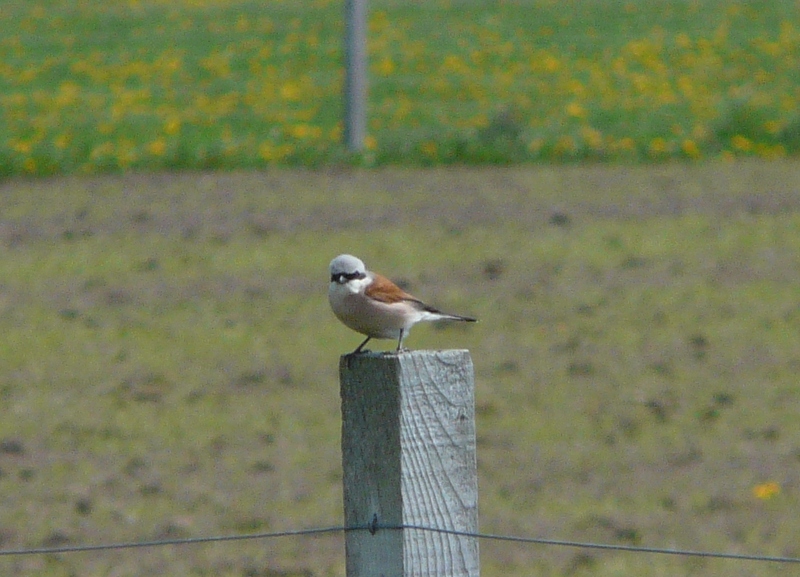 The 2 Red-backed Shrikes were still in the Ancum area and 8 of the Tree Sparrows also remain. As the wind had picked up and was still NNW, seawatching was again the order of the day with sessions from the point at Westness in both the morning and afternoon producing some excellent spring totals, especially of Skuas. The highlight was a total of 45 Long-tailed Skuas including a fabulous group of eight which spent 15 minutes resting on Torness until they were scattered by one of the territorial Bonxies and 12 Pomarine Skuas which flew though in several groups. Other species seen during these watches included 17 Great Skuas, 4 Arctic Skuas, a late Little Auk, a Manx Shearwater, 130 Gannets, 54 Kittiwakes, two Common Terns, 67 Puffins and 240 large Auk sp. Land based observations were limited but did include the 1st summer Glaucous Gull still frequenting the recently ploughed fields, the male Red-backed Shrike still at Ancum and a late Snow Bunting. Long-tailed Skuas - definately worth leopard crawling across wet grass for! In the blustery north-westerly winds, sea-watching was the order of the day and after a couple of failed attempts in recent years, catching up with a few passing Skuas was undoubtedly the days highlight. Three and half hours of watching, in two shifts from a sheltered dyke on the point at Westness saw 3 adult Long-tailed Skuas (2 at 14.10, and a single at 14.55) and an adult Pomarine Skua (at 1510) pass by. Also seen during the days sessions were 3 unidentified Skuas, 2 Arctic Skuas, 3 Manx Shearwaters, the first 4 Common Scoters of the year, 2 Red-throated Divers and 136 Puffins. On land the Paddyfield Warbler was still at South Gravity and the Marsh Warbler from 18th has reappeared at Barrenha. 2 Red-backed Shrikes in the Ancum area included a new male, the Turtle Dove was still present and the Glaucous Gull was following a plough at Lenswick. A much nicer day, thankfully without any fog! The Paddyfield Warbler was still at South Gravity, although it only showed for 10 seconds in the morning before vanishing for the rest of the day! A first-summer Glaucous Gull was new and there were now 7 Black-tailed Godwits present. The female Red-backed Shrike was still at Ancum and a Turtle Dove nearby was also an old bird, while an extremely fat Dunnock caught at Holland House and found to be wearing a Norwegian ring was presumably the marked bird seen five days ago. After over a week of avoiding the Holland House mist-nets we finally managed to out-smart and catch a couple of the Tree Sparrows for ringing this morning! With thick fog from dawn until mid-afternoon expectations were fairly low today, so the discovery of a Paddyfield Warbler in the long grass at South Gravity was a very welcome surprise. This is the third record for North Ronaldsay but the second in the last two Springs, following last years June bird. The only other new birds today a Black-tailed Godwit, a Collared Dove and 2 Common Redpolls, while likely lingerers from recent days included a handful of common Warblers, the female Red-backed Shrike and 4 Spotted Flycatchers. Some record shots in the doom and gloom of today's Paddyfield Warbler. It occasionally sang from deep inside a fuscia bush, but most of the time was fairly mobile and elusive in the long grass-hopefully better photo's tomorrow if it remains! The day began and ended with a blanket of fog covering the Island but in-between it was a pleasant warm day, with the wind dropping completely. 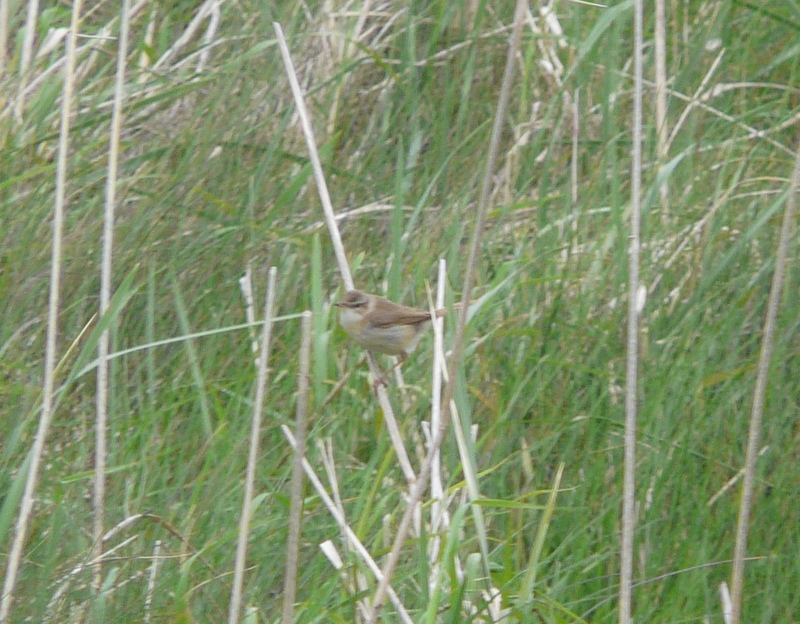 Highlights included a female Bluethroat in the road near Purtabreck, an Icterine Warbler at Ancum Willows where yesterdays 2 Red-backed Shrikes had also relocated. 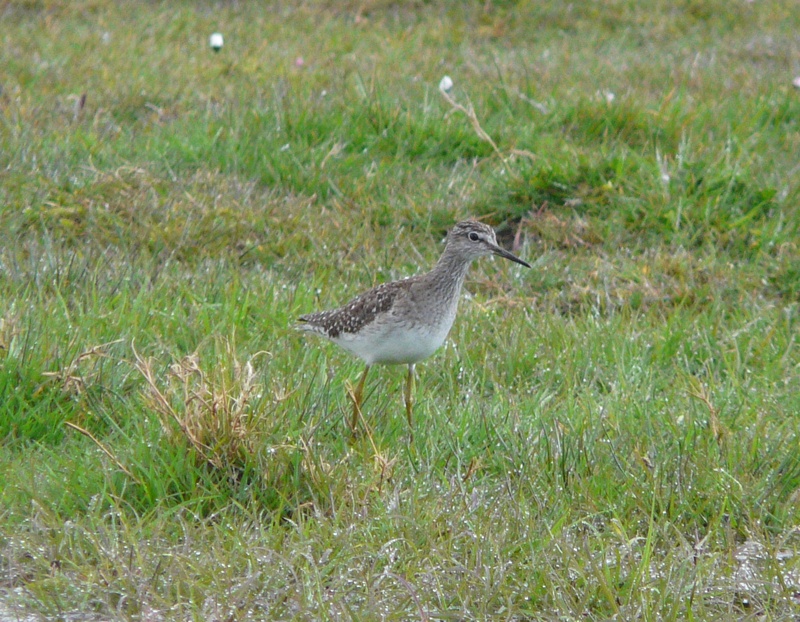 A Greenshank was seen an the first Manx Shearwater of the year passed by the north end. A new male Sparrowhawk was at Holland, the 9 Tree Sparrows were still at Kirbest but singles of Redwing and Snow Bunting were new arrivals. The strong north-easterly wind made for a challenging but productive days birding with several new migrants and a few scarcities found during the morning. The best of these were the earliest Marsh Warbler by a couple of days at Barrenha and a stunning 'bright red' male Common Rosefinch at Trebb. The south end of the Island yielded most of the birds where 2 Red-backed Shrikes spent the day around the Observatory. 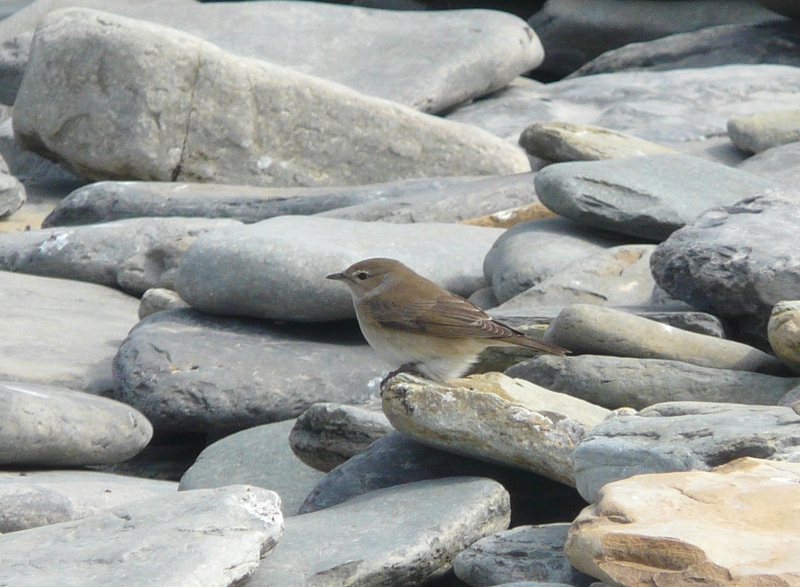 Other notable migrants included the 2 Grey-headed Wagtails still, 11 Tree Pipits, 3 Redstarts, 19 Willow Warblers, a Wood Warbler at Howar, 4 Spotted Flycatchers and 6 Pied Flycatchers. 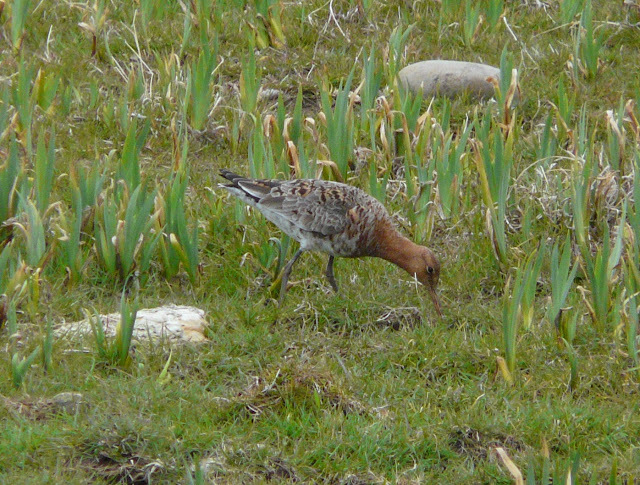 A Little Stint on the Links was the first of the year, the first-summer Little Gull was back at Bridesness and the male Sparrowhawk was also seen again. In an increasingly cool northerly wind there was still a fair bit to see with a few new arrivals and roughly a third of yesterdays migrants remaining. Definite new birds included a Mistle Thrush, a new Cuckoo and a couple of Swifts. 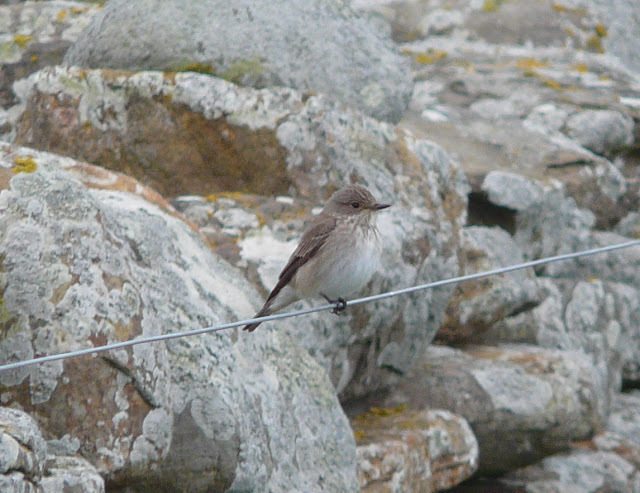 Yesterday's most numerous migrants; Tree Pipit and Willow Warblers returned counts of 16 and 18 respectively with the other Warbler species, Pied and Spotted Flycatchers present in just low single figures, while not a single Redstart could be found (11 yesterday!). The 2 Grey-headed Wagtails were still near Gretchen with the Curlew Sandpiper also still on the loch there and other lingering birds included the Whooper Swan, male Sparrowhawk and Turtle Dove. A gorgeous day with a light easterly wind produced an excellent array of common migrants scattered across the whole island; the highlights included an Osprey which flew north up the west coast mid-morning, the first Swift of the year, a female Hawfinch which was trapped at Holland House in the evening and two Grey-headed Wagtails near Gretchen - also the first of the year. 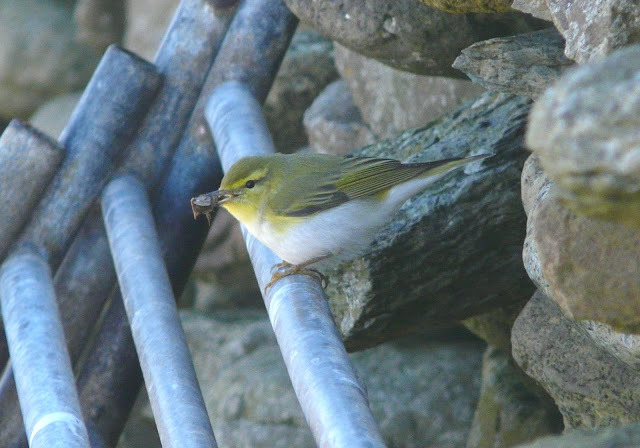 The commonest migrants today were counts of 32 Tree Pipits and 35 Willow Warblers which included a Norwegian control trapped at the Obs at lunchtime. The roll call of the other species included a Sparrowhawk, a Peregrine, a Stock Dove, another Turtle Dove, a Short-eared Owl at Hooking, 63 Swallows, two House Martins, 11 Redstarts, a Whinchat, 6 Sedge Warblers, a Reed Warbler, three Lesser Whitethroats, 6 Whitethroats, 7 Garden Warblers, three Blackcaps, a Wood Warbler, 6 Spotted Flycatchers and 10 Pied Flycatchers. There was also a few birds which are more associated with winter than the lovely spring day we had with yesterday's Whooper Swan near the lighthouse, a 2nd summer Iceland Gull near Bewan, single Fieldfare and Song Thrush and two late Dunnocks. With the wind back in the east and a bit of rain in the morning there was a nice selection of birds present as the highlights included a single Dotterel on Torness, a Wryneck at Ancum, a female Red-backed Shrike at Brigg and an Icterine Warbler found late on at Lurand. 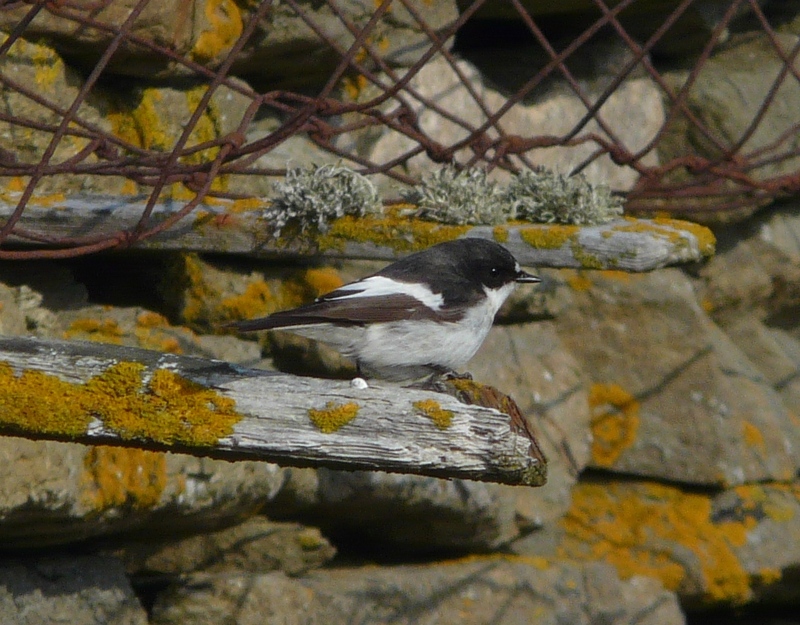 Other migrants logged through the day included a Sparrowhawk, three Woodpigeons, 5 Tree Pipits, 2 Redstarts, a Fieldfare, 2 Pied Flycatcher, two Sedge Warblers, 4 Lesser Whitethroats, two Whitethroats, the first Garden Warbler of the year trapped at Holland, three Blackcaps, three Chiffchaffs, 9 Willow Warblers, a Common Redpoll and an influx of 6 Carrion Crows while yesterday's Cuckoo and Turtle Dove were still around Holland. Also of note was an unseasonal Whooper Swan which joined a pair of Mute Swans on Brides Loch and at least 42 Knot feeding with large numbers of other waders around the shore which included 800 Turnstone. A very blustery day with frequent, nasty showers whipping through saw the first Cuckoo of the year seen around Holland House in the evening but unfortunately it bounced out of the mist nets a couple of times without getting caught; unlike the Turtle Dove which did manage to get caught - an unusual and not annual capture! Migrant totals included a Heron, single Wood and Common Sandpipers, three Collared Doves, a Tree Pipit, a Sedge Warbler, 4 Lesser Whitethroats, three Blackcaps, 4 Chiffchaffs, 4 Willow Warblers and a Pied Flycatcher. 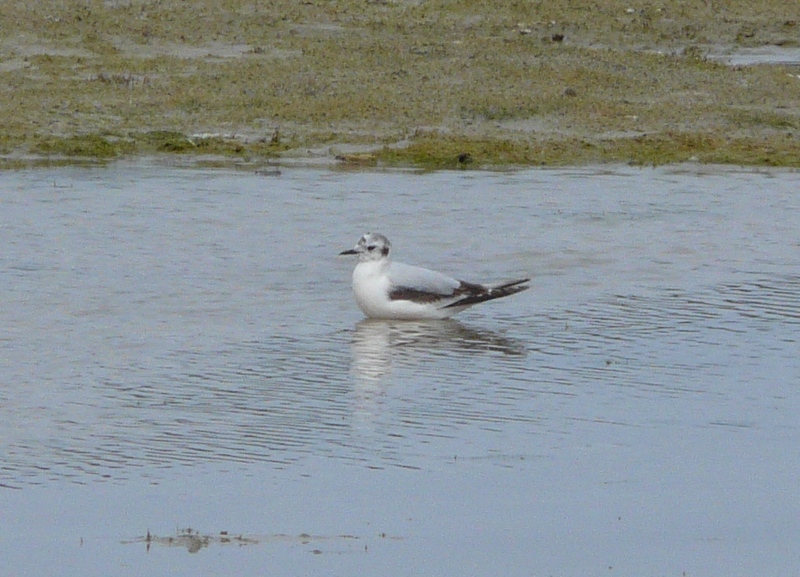 The 1st summer Little Gull and the flock of Tree Sparrows remained. Strong south-westerly winds with heavy rain hitting mid-afternoon saw a handful of new arrivals with the highlights being a Hobby at the lighthouse and a 1st summer Little Gull at Brides Loch. Other totals through this quieter day included 5 Black-tailed Godwits, two Common Sandpipers, two Sedge Warblers, a Lesser Whitethroat, a Whitethroat, 5 Blackcaps, three Chiffchaffs, 8 Willow Warblers and a Pied Flycatcher while the flock of 9 Tree Sparrows were relocated at Caven. A lovely, sunny, calm morning with a light westerly wind which gradually changed into a very wet late afternoon with a strong SE wind saw only a few new arrivals with a Turtle Dove at Sangar, a smart breeding plumaged Curlew Sandpiper on Gretchen and a record equalling flock of 9 Tree Sparrows which bombed over Holland House in the afternoon the pick of the sightings. Other birds recorded through the day included a Common Sandpiper, a Short-eared Owl at Ancum, two Tree Pipits, three Lesser Whitethroats, two Whitethroats, 4 Blackcaps, 5 Chiffchaffs, 4 Willow Warblers, a Spotted Flycatcher, 4 Pied Flycatchers, 10 Rooks feeding on a recently ploughed field, a Siskin and a Common Redpoll. Light rain all morning left at lunchtime making way for a glorious, sunny, calm afternoon which produced the highlight of a fine male Bluethroat at Lochend; other migrant totals included two female Red-backed Shrikes lingering from yesterday, single Tree Pipit, Redstart, Whinchat, Ring Ouzel, Fieldfare, Spotted Flycatcher and Sedge Warbler, a small influx of 6 Pied Flycatchers, three Lesser Whitethroats, 5 Whitethroats, 10 Blackcaps, three Chiffchaffs, 14 Willow Warblers and two Song Thrushes. The wind had switched to the west by early evening, hopefully the change in weather will produce some different birds after this spell of easterly airflow. With the wind still in the east and some light rain in the early morning, hopes were high for some more new birds through the day but it proved to be slightly quieter than expected with the days highlight being three Red-backed Shrikes - a female at the Obs, a male at Westness and another female at Longar and the first Whinchat of the year in the north. 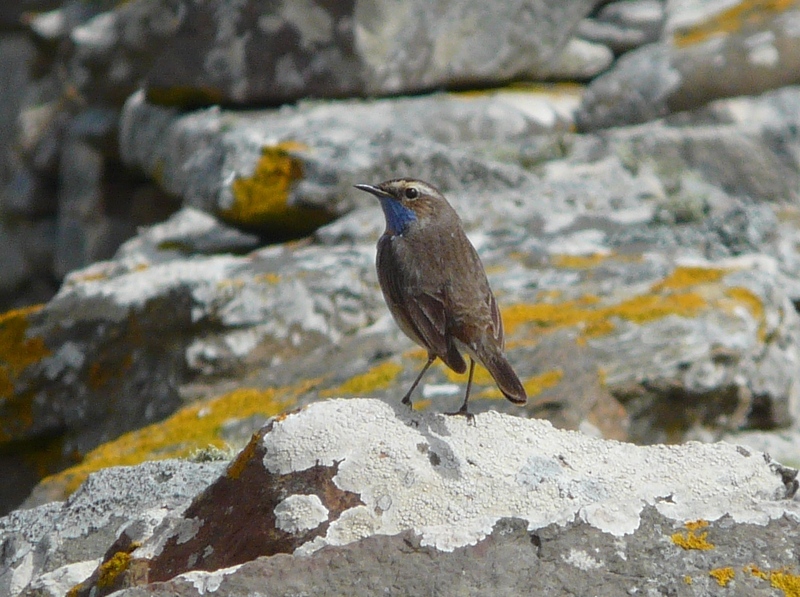 There was a scattering of other migrants across the island but it was unclear whether they were new birds of 'leftovers' from yesterday; totals included a Peregrine, 4 Woodpigeons, 30 Swallows, two House Martins, a Tree Pipit, two Redstarts, a Ring Ouzel, two Song Thrushes, two Sedge Warblers, a Lesser Whitethroat, a Whitethroat, 8 Blackcaps, three Chiffchaffs, 12 Willow Warblers, a Spotted Flycatcher and a high count of 9 Reed Buntings. Definite 'leftovers' included the Green Sandpiper at Sangar, the Grasshopper Warbler at the Obs and at least five Goldfinches remaining around Holland House. A damp, drizzly start rapidly cleared up into a lovely sunny day with a light easterly wind, last nights heavy rain seemed to have done the trick with a great arrival of birds across the whole island; year ticks came thick and fast with a Wryneck at Nether Linney, a Wood Warbler in Lenswick, five Spotted Flycatchers scattered around, a male Red-backed Shrike at the Mill, a Grasshopper Warbler trapped at Twingness and a late Waxwing which came in off the sea on the west coast. Other grounded migrants included two Sedge Warblers, 6 Lesser Whitethroats, 4 Whitethroats, 14 Blackcap, 16 Chiffchaffs, 27 Willow Warblers, a Pied Flycatcher, two Redstarts, two Ring Ouzels, 5 Tree Pipits, a Fieldfare, three Robins, three Common Redpolls, a Brambling, 13 Rooks and two Collared Doves. Raptors and waders were also well represented with a female Marsh Harrier, a ringtail Hen Harrier, two Sparrowhawks and a Kestrel while a Green Sandpiper, two Common Sandpipers and a Wood Sandpiper were noted. 53 Swallows, 10 House Martins and two Sand Martins were whizzing around, four Dotterels and 10 Goldfinches were seen again while six Arctic Skuas and 53 Arctic Terns have started to display noisily around the isle! An excellent and very enjoyable day! A hazy day with a brisk easterly wind saw the best arrival of migrants of the spring so far with birds starting to appear from late morning onwards; new for the year were two Lesser Whitethroats, a Reed Warbler at the Surgery, a Whitethroat, a 1st summer male Pied Flycatcher trapped at Holland in the evening, three Common Redpolls and a Common Tern off the south end. Other birds seen through the day included a brilliant trip of 8 Dotterel on Westbanks, a Stock Dove near Holland House in the evening, a Wood Sandpiper, a group of six Pink-footed Geese, three Woodpigeons, a good passage of at least 58 Swallows, a House Martin, a Tree Pipit, 7 Blackcaps, 9 Chiffchaffs, three Willow Warblers and a record equalling flock of 10 Goldfinches. Rain set in late evening bringing with it high hopes for tomorrow! Overcast conditions with a light easterly produced a selection of new birds, however thick fog rolled in early afternoon slowing new arrivals down to a trickle. The days migrant highlights consisted of the first Wood Sandpiper and Sedge Warbler of the year, two Black Redstarts and the Hornemann's Arctic Redpoll which reappeared near Ancum. Other birds included a Sparrowhawk, three Tree Pipits, 80 Wheatears, a Blackcap, two Chiffchaffs, five Willow Warblers and single Goldcrest, Brambling, Greenfinch and Snow Bunting while at least six Goldfinches remained. Wader passage is becoming more pronounced with some high counts noted today including 1,163 Turnstone, 12 Knot, 16 Whimbrel and an island record 430 Purple Sandpipers. A calm day with a light southerly based wind produced a good variety of migrants; most notably a 1st summer female Marsh Harrier seen around Ancum, the first migrant Kestrel of the year, at least four Tree Pipits and an increased count of 327 Meadow Pipits. 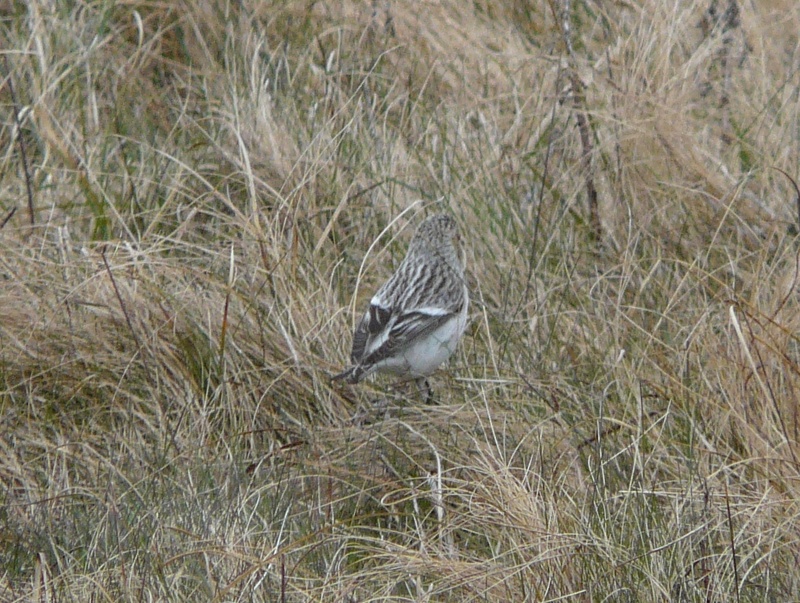 Other birds included 12 Whimbrel, two White Wagtails, a Robin, two Chiffchaffs, two Willow Warbler, a Brambling, three Siskins, a group of three Redpoll sp. which were probably Lessers and in what is turning out to be an excellent spring for the species, at least 8 Goldfinches - in context, we have now ringed the same number of birds this year, as previously in the entire history of the observatory! A pleasant day with just a couple of spells of drizzle mid-morning to complain about; the cracking Hornemann's Arctic Redpoll showed well again although it was slightly more mobile through the day ranging as far as Westness. New migrants included 5 Sand Martins, 13 Swallows, a count of 67 Wheatears, 6 Chiffchaffs, two Willow Warblers, three Goldcrests (including a British control caught at Holland), 4 Goldfinches and 9 Siskins. 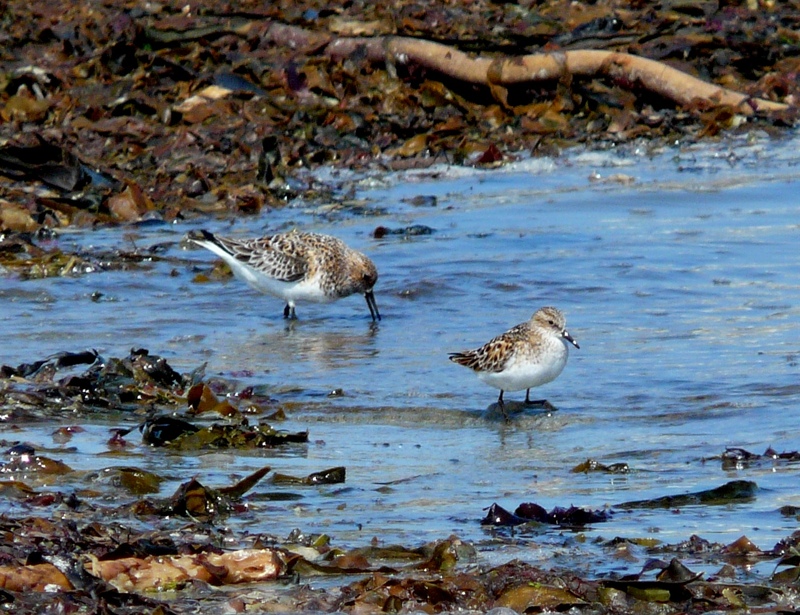 More breeding birds are starting to show up now with 10 Arctic Terns and a single Arctic Skua noted while contrastingly 'winter' birds are still evident with a Lapland Bunting, three Snow Buntings and 14 Redwings lingering on the island. A very pleasant, calm morning gave way to a nasty windy and rainy afternoon but the good conditions in the first half of the day allowed the bird of the spring so far to be found in the fields near Sangar - a somewhat unexpected, yet cracking Hornemann's Arctic Redpoll which occasionally gave small snatches song and even attempted a few small display flights as it showed well along the stone dykes (the 9th hornemanni Arctic Redpoll for the island yet the first in spring). There was little else through the day to match the Redpoll, although migrants did include a Short-eared Owl near Hooking, two Sand Martins, 16 Swallows, a Fieldfare, two Willow Warblers, three Chiffchaffs, 7 Siskins and 6 Lapland Buntings. The magical combination of easterlies and rain overnight failed to produce large numbers of birds with the year's first Common Sandpiper the day's highlight with a small arrival of 104 Wheatears, 5 White Wagtails, a Fieldfare and three Siskins alongside. A count of 446 Turnstone was the largest of the year so far and four Lapland Buntings remained in Kirbest with the males starting to look very impressive as they gain their summer finery. A calm day with the wind gradually moving round to the east and persistent rain setting in by mid-afternoon produced a few new migrants including another influx of 26 Black-tailed Godwits, 7 Sand Martins, 12 Swallows, 2 White Wagtails, 65 Wheatears, 5 Chiffchaffs, 3 Willow Warblers and 3 Siskins while the Little Gull was seen again. There is also a selection of birds lingering which remind us that its still early spring up here including 14 Great-northern Divers, 6 Pink-footed Geese, 14 Redwings and 4 Lapland Buntings. 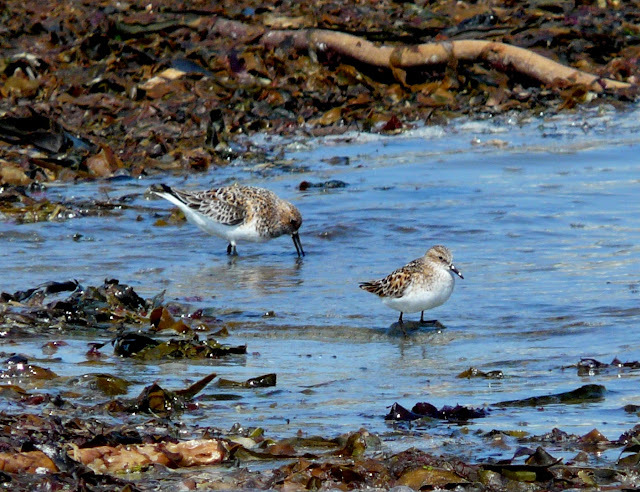 Very strong westerly winds battered the isle on the first day of the new month, there was however some signs of passage especially with waders as there were some improved counts today including 42 Knot and 36 Dunlin while 4 Black-tailed Godwits, 6 Whimbrel and 313 Turnstone were noted. Yesterday's first year Little Gull remained around Garso and was joined by a fine adult Iceland Gull which was loafing with the breeding Common Gulls while 9 Arctic Terns were seen passing offshore. Landbirds were understandably less well represented although only our second Willow Warbler of the year was seen at the Obs along with a new Sparrowhawk, single Woodpigeon and Collared Dove, an increase to 16 Swallows, 4 White Wagtails and a Chiffchaff.